Anybidy getting rid of their stock e500 rims. and come to realize that I would like a larger wheel, but I do not want to comprimize my ride all that much. Roads here in NY are not so hot and I don't want to have to bend out a rim all that often. and thought I might get a deal if any of you e500 owners were looking to upgrade to a larger wheel and wanted to unload your stock wheels? I figure 17in, 45 profile should be a good compromise. If nobody have wheels avail, besides ebay, do you know where I might find them... or could you suggest a style wheel about that size..
My wheels (17x8.5 et38) without tires off '03 E500 are available for $800 firm. Brand new condition. Delivery miles only (about 12mi). Never drove on them - were taken off the day I bought the car a year ago. MSRP at local dealer is $332 each for total of over $1,200 + tax. I am in NYC too. Do you any have photos? '03 E500 wheels have the exact same design as all E320 wheels, including yours - just bigger and wider 17x8.5 E500 vs. 16x8 E320. But on a car the difference is substantial: while E320 wheel looks small and out of place with 225/55-16 tire, the '03 E500 wheel with 245/45-17 tire, IMO, looks just right. BTW, I missed the last sentence in your original post - those are '04/'05 wheels - mine are '03 version that you may or may not want. As far as pictures, if you just want to see them on a car, I suggest finding '03 E500...there are plenty in NY or visit a dealer...and park your car next to it. The difference is much greater than 1" would suggest. If the reason for pictures is to see my wheels condition, then there are two things: one, when I say they are new - I mean it; two, since we are both in NY area getting together (at one of the area's dealers if you like) and actually see them is the best way. If you are interested, please reply here and I will provide a phone number for you to reach me and discuss further. is there a difference in the rim style in that year? will it not fit on my car? 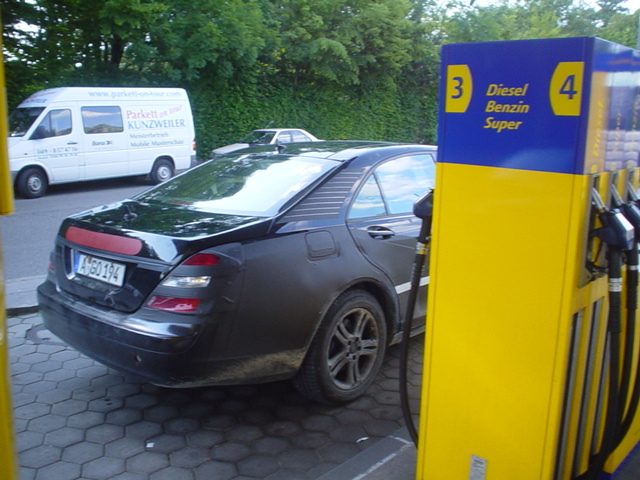 I did not say "may or may not fit" - it will definitly fit, instead I said "you may or may not want" them as the wheels in your picture are similar to '04/'05 E500, '03 are... well I do not want to repeat myself. Read my previous reply above - it is very detailed. sorry for the delay, been kinda busy. If so, I would like to come check them out. If these are still avaliable I would like to buy them. Please email me direct. 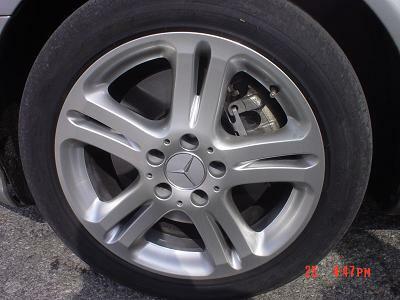 Above picture is of '04/'05 E500 "standard" wheels. If your read what I said before, you would see that MB changed the design of "standard" E500 wheels after '03 model year. The '03 E500 wheels are different - they are EXACTLY the same design as your '03 E320 and all other "non-sport" '03-on E320s, but BIGGER and WIDER. Alternatively, I see that MB offers a 17" wheel, 4 for $992. Has anyone seen these? Quick Reply: Anybidy getting rid of their stock e500 rims.